Supercharge your analog security system with Honeywell’s HQA (High Quality Analog) technology for High Definition 1080p images over your existing coax infrastructure. Our newest HQA DVRs use an over-coaxial cable analog HD video transmission standard to allow long-distance HD transmission at a lower cost. The Performance Series HQA DVRs are the economic alternative for achieving HD video surveillance while retaining your existing BNC cables and cameras. View up to 16 channels simultaneously on your monitor with 960 × 540 preview. Record all channels @ 720p full frame rate. Each channel supports HQA/analog video input; up to 8 additional channels support IP video input. The Quick wizard and plug-and-play (like traditional DVRs and analog cameras) make setup fast and easy. Physical installation within minutes with the help of a comprehensive and easy-to-understand quick installation guide. Internal storage options from 1 to 4 TB depending on the model. Storage is expandable up to 6 TB for 1 SATA units and 12 TB for 2 SATA units. Store videos and snapshots to external storage such as the client’s PC, through the Internet. Store videos and snapshots to a USB storage device. Monitor from anywhere using the mobile apps for iOS and Android devices. All channels support synchronous playback and smart search (search for video that was recorded because motion was detected in a selected area). Configurable motion detection and camera tamper detection settings, including configurable event notifications, such as automatic emails (with attached video or snapshot) and automatic alerts (such as buzzers). Remote configuration and firmware updating through Honeywell Viewer web client and the Honeywell Config tool. 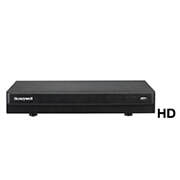 Password-protected access to the camera’s and DVR’s video and network setup. Bidirectional communication for the DVR. The Performance Series HQA Hybrid 1080p DVRs’ HQA technology makes these DVRs perfect for installations where you want HD-quality video while still using your existing coax infrastructure. These HQA DVRs also deliver higher quality video than current 960H analog systems, but at a similar cost. The Performance Series HQA 1080p Hybrid DVRs can be configured to automatically detect and respond to events such as motion in the scene, alarm inputs, video loss, and/or tampering. Sending a notification through email, FTP and/or HTTP. Uploading still images at the time of the event through email and/or FTP. Recording a video clip of the event to a configuredthe client’s or network-attached storage.